It’s the middle of the night and I’m thinking about shopping. This is not good. I’ve been shopping for a quilt. The one on our bed is shredding to pieces. 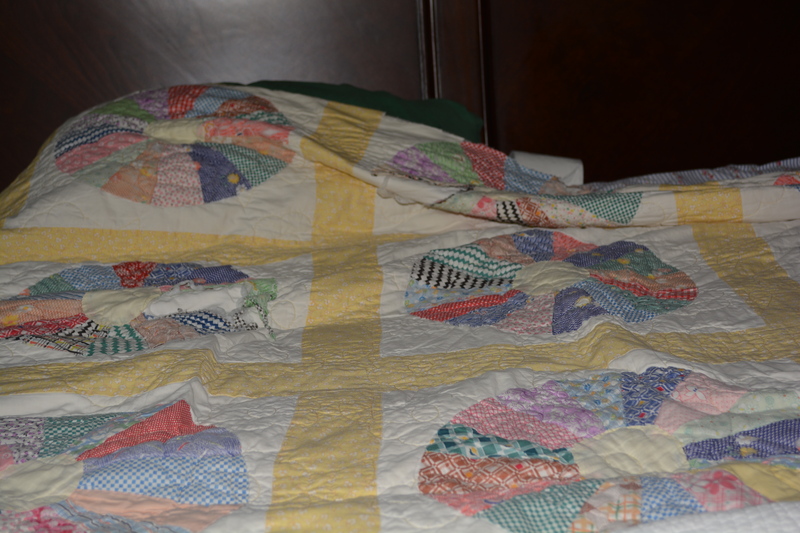 Some unknown hand stitched the patterns of our yellow quilt 60 or 70 years ago. It had been a top, unfinished, and rescued from a thrift store by my sister who gave it to me. I’d taken the quilt top, found just the right fabric back, asked the machine quilting lady to work on it. She put cotton between; machine stitched it tight and bound the old and new together at the edge. The bright pieces have provided us happy cover for many years, but age has finally destroyed whole sections. I would make us another one, but am quite slow at the task. We’d have nothing but a sheet to keep us warm if I were to wait on me, so store bought it must be. It doesn’t seem like such a daunting task to find a red cotton quilt, sturdy and well made, with a bit of gold and blue (like the one from PB I’m in Love with), and one that we can afford. I am baffled that even some of the high end stores have nearly cut the weight of the cotton in half. The batting feels nothing but the weight of tissue paper. There are a few exceptions, these tend to be solid colors. I’m thinking cotton must be very valuable these days. Sleeping under polyester makes me sweat. Maybe everyone else has figured this out, and the stores, instead of wanting to sell one good cotton quilt, want to sell 3 or 4 light weight ones per bed. The layered look. In any case, I pull the yellow up round my shoulders and role over. RIP… I’m wondering if, though made out of pretty good stuff, I myself am stretched too thin and disintegrate easily when tugged by life. I’m thinking I’d like to be made out the good stuff, layers of heavy 100% cotton, warming the world with my colors. I’m thinking I need some patching up as have been a bit fragile lately. I want to be present, functional, a healthy wife and mom more than anything. I doze off into mostly lavender with a bit of green and yellow. Darn it! Now you got me drooling over PB quilts! Can’t afford it either! But it is fun to dream. I hope you find just the right quilt!